Clicking on the link for each mantra below will take you to a page where you can read about that mantra, see the figure associated with the mantra (where applicable), and listen to an audio version of the mantra. You can chant along to the mantra until you’re confident that you have it fully memorized. There are ten repetitions of each mantra (more or less) to help give you time to learn the mantra and chant along. You can replay the mantra until you think you’ve got it. Please note that the mantras as written on this site lack some of the diacritic marks that allow for an accurate representation of the pronunciation. It’s best to listen to the audio files in order to get a better appreciation of how they are pronounced (taking into account the fact that I have a Scottish accent). In the heading of each page I’ve represented long vowels with a double vowel (eg. aa) or, where it’s possible to reproduce these in html, with a letter and diacritic mark (e.g. &amacr;). Note: Tibetans typically pronounce some Sanskrit sounds in a non-standard way. For example they’ll tend to pronounce “padme” (pa-dmé) as peh-mé, and “svaha” as soha. Those who are familiar with the Tibetan pronunciation will therefore notice differences such as these. (For other images of Buddhist figures we recommend visiting the site of this Tibetan thangka painting school). my wife is a nurse and she wanted to know if ther were and healing mantras or a mantra related to her feild of work. The White Tara mantra is said to promote long life, so that’s one candidate. The other, though, is a mantra that we don’t yet have on this site, and it’s the Medicine Buddha (Bhaishajyaguru) mantra. If you Google it you’re bound to turn something up. I attend the Five Buddha Shrine in LAs Vegas, I know that they would be more than happy to help you out with healing mantras such as one for diabetes and for the kidneys. They’re amazing people & have helped me tremendously. Here is their info. Dari Rulai Lohan Temple – Five Buddha Shrine Vajrayana Buddhism 3043 Garnet Court Las Vegas, NV 89121 (702) 641-0522 Ask for Paul, JEN T, or David or find them on the web. Hope that helps. By the way – This is my favorite informative/spiritual site – currently on the web- Thank you. Is there a way to download the fonts needed to see the diacritic marks? Good to hear from you. To see the diacritics you’d need (1) to have a Unicode font installed on your computer. And (2) your browser (Internet Explorer, Firefox, Safari, etc) will need to be set up to actually use that font. Unicode is not itself a font — it’s a type of font that, to the best of my understanding, includes a wide range of characters that are non-standard in English, as well as the usual characters you’re used to. “Arial Unicode MS”, for example, is a commonly used Unicode font. There are some instructions here that explain how to get a Unicode font onto your computer and (lower down the page) how to get your browser to use that font. I hope that’s helpful. This is all a bit technical and out of my area of expertise. We still don’t have a page on the Medicine Buddha mantra, but we do plan to add one. You might be interested to know that the correct Sanskrit form of the short mantra is (tadyath&amacr;) oṃ bhaiśajye bhaiśajye mah&amacr;bhaiśajye bhaiśajye r&amacr;ja samudgate sv&amacr;h&amacr; (although your version has one bhaiśajye fewer and may be an alternative short version). This mantra seems more than most to be mangled in Tibetan pronunciation. This doesn’t mean the Tibetan mantra is wrong. Tibetans have been doing it that way for a long time, of course, so they way you’ve rendered the mantra is therefore the proper way to pronounce the mantra in the Tibetan tradition, and if you’re part of that Tradition then you really have to chant it that way or you won’t be able to join in with their rituals, but I think it’s also good to know what the original Sanskrit is. Tadyatha Om bekaja bekaja Maha bekaja bekaja raja samudgate ya Svaha. You can’t really make sense of all this variation without looking at the Sanskrit. Please will someone record the 100-syllable Vajrasattva mantra (and then the 500-syllable mantra). The only recording I can find is by Tibetan monks; it sounds indescribably beautiful but Sanskrit with a Tibetan accent is SO difficult to follow. It’s on my famously long list of things to do — but I do promise I’ll get that done. I’m sorry to hear about the painful situation you’re in. I don’t think that there are any mantras that can “make” things happen, but a mantra of peace like the Avalokiteshvara (Chenrezig) mantra will help you develop compassion for yourself and for the other people involved. Even if you don’t get the outcome you would like you’d feel more at peace. But although it’s hard to do it’s very important that you let go of any craving for a particular outcome (like getting your lover back) — that kind of craving just causes suffering for everyone concerned. If you let go you’re more likely to be at peace and also more likely to get what you want. Hi. I’ve read that ‘infinite potential’ is an important theme in Buddhism, and I was wondering if there were any Buddhist mantras or phrases that address this theme? This mantra points directly towards our own Buddha Nature, which is our unlimited potential for compassion and wisdom. I hope this is helpful. You are doing a great job for every bodhi heart finding their way to buddhism. May the Blessing of the Triple Gems be with you and all living beings. These Buddhists mantras are great, and could be practised anytime of the day and place. May the Blessing of the Triple Gems be with all. Are there any mantras to ward away evil and mantras for protection? In essence all mantras are protective and help ward off evil. Vajrapani, however, is noted as a protector and appears in an early Buddhist text as a protector of the Buddha. Tara also protects from dangers. Lastly, can I suggest one of my guided meditations, which encourages the visualization of a protective aura. This is something I used to do when I was feeling stressed. The aura I visualized gave me a strong sense of being calmly protected within a bubble. Ah, thank you very much for answering my question. I would like to ask another question, if it’s not a bother to you. Is it alright to read suttas and mantras in English? Or would it be better to read them in Pali? Chanting mantras in the original language is pretty much standard practice. They generally don’t have a lot of conceptual context and since they’re generally short it’s not too hard to get a sense of what, if anything, the words mean. But studying Buddhist suttas or sutras in the original is a massive undertaking. I studied Pali at university for two years and I still have to pick my way through a text with a dictionary and a grammar manual on hand. For all but scholars (amateur or professional) it’s much better to read those in translation. Thank you very much for answering my questions and sharing your knowledge. I get a lot out of picking over a text with dictionary and grammar in hand. I usually learn more, sometimes I memorise the text, and I get a more detailed understanding. Of course one covers less ground, but it’s more satisfying in the long run to know one text in detail, than a dozen superficially. Me too, Jayarava. Especially when I’m teaching from a text (we were studying the Dhammapada in my prison class a while back, for example) I like to look at the original. And Ratnaguna’s going to be doing a weekend on parts of the Sutta Nipata and I wouldn’t dream of going without checking out the Pali. But I’d classify us more as amateur scholars. For the vast majority of people who are just starting out it’s likely going to be a better use of their time and energy just to understand the teachings in their native tongue. I have only just started investigating Mantras and chanting .. have been listening to ‘Karma-avoiding Mantra’ and it seems to ‘speak’ to me .. what is the chanting about and what they are actually chanting (phonetically)? Not knowing what the actual words/sounds are I get too caught up trying to figure that out rather than just concentrating on the sounds themselves. Hi Diane: I’m afraid I’ve never heard of that mantra. Thanks for such a quick reply .. This is a link to it if you would like to listen ..
Well it begins with an Om and ends with a soha/svaha, but because it’s a far-eastern version of a mantra I can’t even guess what the middle part is. If you really like this mantra it’s from a CD called “Buddhist Chants – Music For Contemplation And Reflection” and it’s possible that the liner notes would tell you what the “lyrics” are. .. you have worked out exactly the same bits I had :) .. The Om and the soha .. I will try the liner notes as you suggest .. Thank you for the lovely mantras you have on this site. 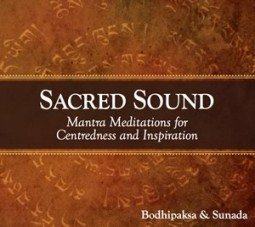 Do you know of a CD with the mantras that are used by the FWBO – Free Buddhist Audio does not seem to have one. Do you have any suggestions? Sadly, I don’t know of any such CD. Sunada and I have been talking about doing something along those lines, but we’ve both been busy with various projects and if it happens it’ll be some way off in the future. Thank you for your suggestion, Kelvin – I’ll certainly follow it up! You might like to try this mantra. namah sapt&amacr;n&amacr;m , samyak-sambuddha kotinam ..
Any mantra, recited with full attention, will protect the mind and give you positive energy. Also found as: namo saptanam samyaksambuddha kotinam tadyatha: om, cale, cule, cundi svaha. It’s not a mantra I’m familiar with and it seems to be a rather late one. There’s a little bit about it on Visible Mantra, the sutra it’s from is found here [old e-sangha.com link removed since the page is now infected with malware], and you can see the script here, although the image is lifted from another site. I am trying for a year to get texts of Budhist mantra and sacred holy books to read. I like to read them, for example from first line to the last. Like I can read the whole Bible or the whole Bhagavad Gita. But all I get is no mantra and no sacred and holy budhist book but zillions of web links that lead me to other Budhist web sites which show zillion more web links but no sign of any budhist sacred or holly book or mantra for me to read. Can you show me a web site where I can read an entire Budhist sacred book and mantra. There are so many Buddhist canonical texts, but no single source as with the Bible or Koran, which may be part of your problem. What’s regarded as a genuine Buddhist text varies from tradition to tradition as well. In the Theravadin tradition the “holy” texts form what is known as the Pali Canon, and this forms a body of work many times larger than the Bible. Some of this is available online at Access to Insight and that’s a good place to start your researches. A text like the Dhammapada is a good one to start with. There are also many later Mahayana texts, including the Heart Sutra, Diamond Sutra, White Lotus Sutra, Vimalakirti Nirdesha, etc, but I’d suggest that it’s generally best to start with the Pali texts since they represent the earliest teachings and they’re generally more straightforward. If you do not mind a recommendation, there is a very special book available called “The Mantra Book” by Lillian Too. It contains many mantras, their meaning, translations and explanations. I have found it worthwhile maybe you will too. in several of her Feng-Shui books. Om unfailing Illuminator, the great symbol, the jewel-lotus-flame set-in-motion h?m. śubhra means white, pure, shining, or immaculate, but given that Vairocana is the illuminator the primary sense is probably of radiance, like the light of a fire (śubhra, or radiance, having been substititued for jvala, or flame). Sanskrit calligriphic translation of the phrase “we attribute this union to a higher source”. Is anyone able to help or make suggestions? 2. Someone to do the calligraphy. There isn’t really a Sanskrit script as such — Sanskrit is written in a variety of scripts and you’d have to choose which you wanted. Jayarava at visiblemantra.org might be able to do the calligraphy, but I’d hesitate to recommend a Sanskritist — perhaps you should check out universities. what type of mantra is “ohm manay paymay hum?”, i use it all the time and i’ve heard that if you whisper it to a hyper animal or an animal that doesn’t feel safe in your hands, it will calm down, is this true? if not what does it do? please answer as i love this mantra and would like to know the complexities of it. That’s the Avalokiteshvara mantra, which is Om Mane Padme Hum (although in Tibetan pronunciation Padme becomes Pémé). My opinion would be that it’s the tone of voice you use in speaking to an animal that makes a difference rather than the words you use. I don’t think the mantra has any special powers. I’m sure some Buddhists would disagree, of course! Anyway, hopefully that link will answer your questions. please can you help me how tp pronounce this i do not wan to make mistakes,namah sapt&amacr;n&amacr;m , samyak-sambuddha kotinam ..
which has reached the Heart’s lotus. liberate all sentinel beings from six realms of sufferings. 1. OM liberates/purifies us from emotions of bliss and pride in the samsaric realm of the Gods. 6. Hum ” ” ” ” ” ” aggression and hatred in the samsaric realm of hell. The mantra Om Mani Padme Hum purifies us at 3 levels, Mind, Speech and Body. Make effort to overcome the 6 relams of sufferings. I’m afraid that none of the mantras we have here are available in CD form at present. I’ve been talking to Sunada for a long time now about putting together a CD, and hopefully that’ll happen before too long. thanks B . also do let me know when it goes on CD or online download if that is not to much trouble. I’d suggest that you sign up for our monthly newsletter since I’m likely to forget to let you know. You can sign up using the form on our home page. I hope we won’t keep you waiting too long. I don’t think in terms of there being mantras that are less or more powerful. In Buddhist practice it’s the quality of attention that you bring to a practice that makes it effective. If you do any mantra with as much mindfulness, faith, and concentration as possible, then that mantra will be a powerful one. It helps if you pick a mantra you’re attracted to — and in some cases that means picking a mantra that’s associated with a Buddha or bodhisattva that you’re attracted to. The interest and faith that you have in the deity will help you commit yourself to the mantra. ‘Om Cale, Cule, Cunde Svaha’, the Chinese version has a closing phrase; “Om Bu lin”. Do you have any idea what the original Sanskrit may have been and what it means? Thank you! I’m afraid I couldn’t begin to guess. Anyone else? I dug around and found that the ‘Bu Lin’ is representing Sanskrit ‘Bruhm’. I looked around more for ‘Bruhm’, and it appears to be related to ‘Brahm’ (maybe?). So, Om Bruhm/Om Brahm being used to close a mantra recitation, might be an invocation of the divine spirit in creation? That is my current theory. The original Sanskrit syllable is bhr?ṃ Ã Â¤Â­Ã Â¥ÂÃ Â¤Â°Ã Â¥â€šÃ Â¤â€š (pronounced boron in Japanese, and bu lin in Chinese). Bruhm is just a spelling mistake I think. In Shingon bhr?ṃ is associated with Ek&amacr;kśara-uśṇīÂ¹Â£a-cakra (Ichiji kinrin) – Wheel of the Crown of a Single Syllable. Also with the KaraṇÃ¡Â¸Âa-mudr&amacr; dh&amacr;raṇī. For more on Uśṇiśa in Japanese Buddhism you could try Grotenhuis Japanese Mandalas. Other Uśṇiśa deities are found in Buddhism as well. A Tibetan version of the syllable can be seen here. My Siddhaṃ calligraphy is here. Another aspect of this bīja is that the strokes include elements of all the 13 main Shingon Deities and so is said to represent them all in one bīja. bhr?ṃ is not obviously related to brahm. It could be bhr? meaning ‘brow’ (they are actually cognate) – bhr?maṇÃ¡Â¸Âala is the arc of the eyebrow for instance. It may hark back to the verbal root bhÃ¡Â¹â€º (to bear) which gives us bhr?ṇ (to hope, fear etc) and bhr?ṇa (an embryo). None of these are particularly connected with the ideas above – but that is mantra for you. Bhr?ṃ is being used here as a bīja for Cundī. Nothing to do with divine spirits or creation or Brahma. Thank you immensely!!! For sharing your scholarship and insight with me! I am grateful to benefit. It would otherwise have taken me much longer to find this information. Yes, the syllable was referred to as the Great Wheel One Syllable Mantra, and so I’m fairly certain that your interpretation is correct. Thank you again! I have a question regarding the importance of pronunciation of mantras. Currently I am chanting the 100 syllable Vajrasattva Mantra and I am aware of the different ways as to how the mantra is pronunced (i.e. Sanskrit, Tibetan, which differs quite a lot). I am thus quite confused as to whether it is really important to get the pronunciation perfect (like the Brahmins who insisted on absolutely correct pronunciation). I’ve read websites that said the attitude behind the chanting of mantra is more important than mere pronunciation – and this sounds like a very comforting advise. You can find my thoughts on this on my blog: A Pronouncement on Pronunciation. Thanks Jayarava. It was very comprehensive and I like what you said about getting as close to the original pronunciation (Sanskrit) as possible. Of course, this doesn’t mean the Tibetan way of saying the mantra is bad or wrong. I guess it bears down to personal conviction, at the end of the day. I also heard the mp3 of the Vajrasattva Mantra you put up and am using it for my mantra chanting – personally, I would like to be as close to the original language as possible. I love animals a lot, this includes the stray. Which mantra should i recite to bless all animals? Thank you. My Rinpoche told me I could chant the Green Tara mantra for all animals. I also read from one of the websites that we could chant the Medicine Buddha mantra for animals and that any animals that hear the Medicine Buddha mantra will be reborn into a higher realm of beings in their next life. reciting it for the meat of animals sold in shops, supermarkets etc etc..
She sent a message through a friend of hers, a student at the Vajrapani institute in California, to ask for advice about healing practices. She was advised to buy animals that were in danger of being killed and to then free them in a safe place, thus enabling them to live longer. This charming woman saved many animals from places where they were going to be killed. She actually freed two or three thousand animals, mostly chickens, fish, and worms. She had the chickens taken care of on a farm, and she freed the fish in open water. She also bought two thousand worms because they were cheap and readily available, and released them in the garden outside her home. Liberating worms was believed to be a particularly good idea as they go straight under the ground when they are released. Since they have some protection there from predators, they have a chance to live longer. It was less certain that animals freed in forests, lakes, or the ocean would have lived longer because they have natural enemies in those places. It is said that when she returned to the hospital for a checkup after doing these practices, the doctors could not find any trace of the cancer.True or not, this story should not come as a surprise to those subscribing to the karmic theory. She was in coma with serious head injury and several doctors were attending to her. imparied, but she could walk again, eat by herself and handle simple conversation. She could remember me, an old friend. I am new to the teachings of Buddha. I have recently acquired some new Tibetan Mala Meditation beads to move into the next step of my desire for inner peace and success in my life and career. What would be a good mantra for me to start with and how long should i use this Mantra(i.e weeks, months) Peace and wisdom to you. My experience has been that mantras are a very personal thing. People experience a number of mantras and begin to learn about the Buddhas or Bodhisattvas (if any) that they represent. At some point something “clicks” and a fascination develops that’s a bit like falling in love. And for years — perhaps the rest of your life — you find yourself turning to that mantra. For me, it was Padmasambhava. For you — well, you’ll have to find that out! Om! Khya khya khyahi khyahi, Hum hum! But I cannot find out the complete dharaṇi in sanskrit. Can someone help me? Thank you very much! The short answer is I don’t know where you would find this dharani in Sanskrit. It’s always possible that the original has been lost, or even that there was no Sanskrit original. I have already found it!!!! Read about this dharani posted by Anibal, described as ‘Powerful Dharani’. Please help to fill in the ‘blank’ boxes as I do not know the missing alphabet letters. The site AnÃƒÂ­bal linked to says, “As the name suggests, the recitation of this Dharani is intended to avoid the calamities of all kinds” and also that the dharani is recited daily in SÃ…ÂtÃ…Â monasteries. So it seems to be common. Would you know the missing alpabet letters ( blank boxes ) in the dharani? Om Ye Dharma Hetu Prabhava Hetu ……….? I’m no “mantra master,” or Sanskrit scholar, but this appears to be a Sanskrit phrase that’s been turned into a mantra and Tibetanized: [OM ] Ye dharma hetu prabhava, hetun teshan Tathagato hyavada, Teshan cha yo nirodha, evam vadi Maha Shramanah [ye svaha]. This would seem to mean “All things proceed from a cause; this cause has been declared by the Tathagata; all things will cease to exist; this is what is declared by the Maha Samana.” In other words it’s a statement of pratitya-samutpada, or conditioned co-production (also known as dependent arising). By the way, I found the “mantra” here: https://www.tsatsastudio.org/practice.htm. And I found a translation in Google Books’ “Journal of the Royal Asiatic Society of Great Britain and Ireland, Volume 16” (https://books.google.com/books?id=rvkAAAAAYAAJ). Today’s Contemplative Practice Moment: The Jesus Prayer « Enlightenment or Salvation? and isn’t dharmadhatu another name for avalokiteshvara or is it the bodhitatwa that he holds. tell me its literal meaning n meaning of above mentioned verse. Thanks for sharing this. The Sanskrit seems rather garbled, and I’m not a Sanskrit scholar by any means and would have difficulty working out what it says. I can tell you, though, that dharmadhatu is a term meaning Reality, or the way things are in their inherent emptiness. Dharmadhatu isn’t a name for Avalokiteshvara, although his nature (along with all things) is Dharmadhatu. I’ll ask my friend Jayarava to take a look at the Sanskrit. Indukumuda – do you have it in Ã Â¤Â¦Ã Â¥â€¡Ã Â¤ÂµÃ Â¤Â¨Ã Â¤Â¾Ã Â¤â€”Ã Â¤Â°Ã Â¥â‚¬ or another Indian script. My Sanskrit has got pretty rusty, but without the proper spellings it is a hopeless case. nawayz my sanskrit teacher anwered me to some extends. b sides i wonder if u know any long homage mantra to tara . if u do plz answer n wat ’bout mantra for 8 bodhisattva? I’m not sure whether you’re addressing your question to me or Jayarava, but I don’t know any long mantra to Tara, nor any mantra for the eight bodhisattvas. If you do manage to get an accurate version of the homage mantra you originally asked about, could you please post it here? well i hav managed to get both mantras in my new bought Daily Practice mantra Book from swayambhunath stupa but its in tibetan… is it ok? n i suppose u should involve the seven linear prayer to guru rimpoche(padmasiddhi) too. trust me its really owesome!! I’m familiar with and love the seven-line prayer to Padmasambhava. I’ve never thought to include it here, although perhaps I should. Some thoughts on this discussion, which probably won’t be new to you, but perhaps to others. It used to matter to Buddhists that pronunciation was correct. K?kai mentions this matter in his writings on several occasions and one of the main reason that Siddhaṃ writing survives in Japan 1200 years after being introduced by K?kai is for the phonetically accurate transcription of mantras. That said almost no one, not even Indians, pronounce Sanskrit as it was pronounced in Medieval times when mantras were composed. Tibetan has very wide variations in pronunciation in Tibet let alone in the West. Not withstanding any of this, Buddhists never seem to have bothered much with what a mantra means. What a mantra does – the magic it performs – has always been the primary thing. There is no traditional text that I know of which goes into what mantras mean in the semantic sense – though I know of several which explore associations not related to the words, but to individual syllables, or even parts of syllables. Mantras occur in texts to accompany and ’empower’ specific actions usually, or to invoke particular deities. So I agree with you that mantra is effective in devotional and mindfulness practices, and in these contexts pronunciation is less of an issue if the intention is clear. Though I would argue that pronunciation has aesthetic value even here. BTW I have an accurate version of the 7 line prayer in Unicode Tibetan and Roman if you want (i need to update visiblemantra because it has errors) – checked by a friend who speaks Tibetan. Then i guess i should insert both of the mantras (of tara and auspicious mantra of 8 Bodhisattva) with their accurate meanings. yet i apologies, for it can be done only after a month. since i am to appear for school leaving board exam from an army boarding school, its impossible to contact you till then. Thanks for your contribution, Jayarava. I think a lot of modern practitioners in the west are interested in the literal meanings of mantras, beyond associations with the syllables. It’s interesting that that’s a new phenomenon. Yes. I’ve tried to provide literal meanings on my website where I can find them out. I suppose there is a fundamentally different world view behind mantras that it is hard for us to experience them as intended by their composers. Foucault talks about the kinds of changes that the European Enlightenment brought in his book ‘The Order of Things’ – knowledge coming primarily through resemblance and association was replaced by knowledge through difference and distinctiveness. The associative link ups based on number – 5 syllables, 5 wisdoms, 5 poisons etc; 6 syllables, 6 elements, 6 realms, etc – don’t make sense to us in the way they made sense in medieval India. Also Saussure brought in the idea that syllables have only an arbitrary connection to what we mean when we speak, which pervades modern scientific linguistics. This precludes the syllable making *any* sense on it’s own. There is some research which undermines this view, but it is difficult to get published. Margaret Magnus’s book Gods of the Word presents her PhD work to a general readership. I think eventually it will tie in with the philosophical work of Mark Johnson and George Lakoff who are exploring the way that physical interactions with the world structure metaphor and other abstract modes of thought. The parts of the brain which control hand and mouth motor neurons are both near the language centres of the brain. So I think modern science may be drawing us back to an understanding of the symbolic richness of spoken sounds. Not there yet though. Of course there are lot of Romantics and other EE dissenters around who are happy to just chant. Sometimes I enjoy just chanting too without knowing or needing to know why I enjoy it. Especially in big groups. anyone wid its possible meaning??? Hi. Yes, it’s namo tassa bhagavato arahato sammasambuddhassa, and it means veneration (namo) to him (tassa) the blessed one (bhagavato) the worthy one (arahato) the fully and perfectly awakened one (sammasambuddhassa). It’s not a mantra, but a common salutation to the Buddha. I though to put this here as for the good of it’s readers. With the syllable Swaha I bow to you. Radiates light that clarifies everything. Those heirs of the Conqueror take her support. All malevolent spirits give praise before her. She annihilates all enemies without exception. By the effulgence of light from the wheel in her hand. She brings demons and universe under her power. She completely delivers all destitute beings. She completely subdues their numerous foes. Dominates the beings of seven netherworlds. She overcomes even the heaviest of defilements. Surrounding ‘hung’, she is the mother who liberates. She is the manifest form of syllable ‘hung’. And even the three worlds she causes to tremble. She clears away every last trace of poison. She dispels all in auspicious dreams and quarrels. She eradicates the most violent epidemics. In my opinion, I would be of great benefits if u learn more upon the exalted Tara and her mandala. And her mantra, benfits, bodhisattva dharani and worship. This would bestow great bliss to you. I would like to know a saying to read or chant to someone in a coma. I would think the best thing would be something that is meaningful to them. If this person is or was a Buddhist, then their favorite Buddhist text. If they were not Buddhist, then perhaps a novel by their favorite author. If there’s some residual consciousness present, would it not be best to present it with what it itself would find interesting and stimulating? Ten years ago, my wife went into coma. There is very slim hope in her case after her operation. I recited the Medicine Buddha sutra, though she didn’t get well, but she did open her eyes and gripped my hand and that was the last look she got. She passed away half an hour later. Best to you and May the blessing of the Triple Gems be with this person and you and all loved ones. I began spending half hr listening to the chant Om Mani Padme Hu for a few days…just over a week or so now…and the innumerable changes it has brought about already is Amazing. I listen to it on my way to work and the way back and some mornings too to keep my perpetual anger at my employees at bay…and wonders of wonders…suddenly I find myself listening to my own calm and peace…and especially the beauty of silence when surrounded by utter chaos…It all comes down to Belief I think…I went about searching for something related to the Buddha to make me accept my anger and move forward to peace and calm…found the chant in ur site and here I am….learning my baby steps to a peaceful calm mind. Thank you very much for being around…deep inside this vast world of the web…yet so close…Thank you. Peace! i really appreciate the way you have been helping people out of their pain. I m a doctor … and its just a diagnostic branch i am in. Patients do tell me at times… that just by my touch their pain was relieved. Even one of the senior surgeon had told me — i have a healing touch!’ Things are good in most part of life. But, i lost my father when i was in school. later i got separated frm my husband. And i made a friend last year… and we promised we will be best friends forever. But somehow .. he is now gone for no reasons. I just wonder , the people i adored the most left me. and i was deprived of love & care most of the times.. even thou i gave my best to them. Can you suggest me some divine way / chant .. so that i can regain the friendship ! It appears silly. But for me … it is a very painful thing to realize that without any reason .. my friend suddenly dosent even feel like talking to me! Thanks for your kind words. It’s good to know that what we do here is seen and appreciated. I’m pleased to hear that you have a healing touch. I’d guess that you’re a kind person, and that you express this in your physical contact with your patients. I’m afraid I don’t have any faith in mantras as “magical” instruments. I think they can give us confidence, and that they can make us calmer, and that they can help us to be kinder and more compassionate. And I believe that all these qualities can make us more attractive to other people. But I don’t believe that they can directly attract people to us. Sometimes when we say, as you did, that something happens “for no reason” we know we’re not really speaking accurately. When someone acts, they act for a reason. And if this friend is not in your life, he has his reasons. So what I wonder is, can you find out what these reasons are? And if you can, can you work to get closer to him again (if his reasons allow), and can find acceptance if his reasons for not being with you are insurmountable? This is where mantras can be helpful. They can help you find the courage to ask questions and to make contact. They can help you have the kindness not to impose on the other person if your contact is unwanted. They can help you have the patience to accept what can’t be changed. But you also have to act, and to communicate. HI I JUST WANT to ask that is there a way to stop this MANtra? because my sister said that she has a mantra and she’s talking to herself everyday and said that he can talk to people thru her minds and sometimes she cant sleep because of talking to the voices that she hears. pls someone who have a mantra to can explain what happen to my sister because it looks like she is crazy. I’m sorry to hear about this. Your sister needs urgent psychiatric help. This isn’t a question about mantras, or how to stop mantras. If someone is imagining that their toaster is sending them messages you don’t go to a toaster repair shop to ask them how to stop the messages. You take the person to a shrink. I wish you and your sister well. She’s seriously ill, but she can probably be helped, at least a little, with medication and therapy. My father is missing from last 7 days. Please help me if is there any mantra which can help me find him back or any news of him? Please I need help…its so painful! I’m sorry to hear that your father is missing. I don’t think Buddhist mantras work in the way that you’re hoping they do, but they can help to calm your mind and take the edge off of your anxiety. I’d recommend the Avalokiteshvara mantra to relax you. and the Vajrapani mantra for courage. Try reciting Avalokiteshvara mantra, it would be helpful. have been searching for an MP3 version of the Short Mandala Offering “Sa zhi po kyi jug shing me tog tram ……… zhing la cho pa shog” and the Taking Refuge and generating Bodhicitta “Sang guya chho dang ….. gya drub par shog”. Is there somewhere I can locate these two for download? Someone else might, Genspa, but Tibetan mantras and chants are way outside my sphere of knowledge. Hi, I am relatively new to the mantras and I would love to know if someone could assist me in the breakdown of some mantras’ meanings? I would so appreciate any help in understanding the specific meanings of the words followed by a question mark. In fact, I have been googling for hours now in hopes of finding the sanskrit meaning of the word. This understanding would so enhance my using of the mantra. Thank you for assisting me in this quest, sort of driving quest to find out what I am saying in the mantra prayers. What is the meaning of the mantras chanted by tibetan monks at the ceremony that happens before they start to make a sand painting? During this time they gather around the place where they will make the sand painting. I don’t know, I’m afraid. The mantras are probably specific to each particular mandala, and the chanting probably includes a lot more than mantras. I am really happy to come across this website and read the knowledge you share. I want to propose to my girlfriend and am looking for a buddhist mantra to inscribe onto something that will bless the marriage, remind us to be compassionate towards each other, and ultimately use our marriage for the benefit of all other sentient beings. Will GuanYins Om mani padme hum be appropriate in asking for compassion on ourselves and towards all others? Perhaps you know of another more appropriate mantra? Thank you so much for any thoughts you can share. I only have 24 hours so very much hope for your reply. Hi, I just wanted to pass along an idea for a mala. I made one to honor the Taras. I chose the Grean, Red, White, Blue, Yellow and Orange. I then strung beads of nine of each color divided by a brown bead between each. This way, I can address Them when I have only a short time to do a mala. I placed a dzi bead at the beginning and a Quan Yin jade below that. It is my way to use the colors as a guide. I also have done a 20 day Practice for the first time and had extraordinary results. So, now I am doing a 39 day Practice and having even more extraordinary results in my life….so many that I am compiling a “Gratitude List” everyday. One gratitude on the list is having found this site….for real!!! Hello, what are the mantras for exams? But additionally, the Manjushri mantra is traditionally associated with intelligence, the arts and sciences. Did you know that research has shown that people perform better on tests if they think of a professor figure beforehand? I’d imagine thinking of a wise Bodhisattva like Manjushri would have the same effect. Good luck with your exams! Haha :D Thank you for your reply. It is alright if the mantra is repeated in my head, instead of saying it aloud? Yes, indeed. This is very commonly done, especially as part of a visualization practice. is there any mantra for fullfill our wishes? I’m sure some people regard mantras as being like magic spells that can make our wishes come true. But I don’t think that’s a very helpful attitude.There’s the question of whether our wishes are kusala (not based on greed, hatred, or delusion) or akusala (based on greed, hatred, or delusion); the idea of using a spiritual practice to fulfill a grasping or hateful desire is bizarre. Mantras should help us let go of unskillful attitudes. But if our desires are skillful — like a natural wish to be free from suffering or to become more compassionate, mindful, wise, and to benefit others — then, yes, mantras can help bring about those wishes. I am new to Buddhist practice. I realy know nothing at this stage. I do know that it feels right for me, I have a lot to learn. How to meditate, who the Buddhas are. I live in Ireland and there are not many Buddhist organisations here. I would love to get some feedeback from you if possible. Sadly my sister Clare committed suicide last April 2012, my only sibling and my parents are gone too, please tell me if her karma is still in turmoil and what happens to a suicide person. Any advice on how I can live a good fulfilling life and help others? Are you on FaceBook? thanks and I love this site very much. Gina (Galway, West of Ireland). I’m sorry to hear about your losses. What a painful thing to experience. Unfortunately there are no easy answers to your question. A traditional Buddhist answer would be that suicide is not an escape from pain, and that the person who kills themselves will be reborn. We cause ourselves much of our own suffering, unfortunately, and we each have to learn to live more skillfully so that we can experience peace. No one can know where your sister is now, but if she is somewhere then Buddhist teachings would say that she’ll have further opportunities to learn and to find peace. But for you, I’d suggest that Buddhism encourages us to be open to the discomfort of uncertainty. The Buddha seemed to suggest that some things are unknowable, and that we find our own peace by living with, and being comfortable with, that not-knowing. I can imagine there aren’t too many Buddhists in Galway. I hope that our site can offer you some guidance in meditation. Under the “meditation guides” link above you’ll find several different meditation practices. I’d suggest starting with mindfulness of breathing and lovingkindness meditation. I’ve looked around and I’ve found a buddhist centre in Galway that belongs to the Zen school, SÃƒÂ´tÃƒÂ´ lineage, I hope you will find out the guidance and the peace you need. The Buddha didn’t actually write anything. He passed on teachings by word of mouth, and those teachings were passed on down the generations for several hundred years before they were written down. When they were written down, the result was a body of writing something like seven times larger than the bible. Some of it isn’t very readable, and it’s not organized in a way that makes it very accessible. For example it doesn’t start with the easy teachings and then work its way to the more difficult ones. If you want to read the original teachings along with some commentary, I’d suggest Bhikkhu Bodhi’s In the Words of the Buddha, which is really excellent. But you might want to start with a good introductory book to Buddhism, like Sangharakshita’s Guide to the Buddhist Path, or Buddhism for Beginners by Thubten Chodron. I recommend to start with “One Dharma. The Emerging Western Buddhism” by Joseph Goldstein. Its a perfect book for beginners. Goldstein goes straight to clarify the essential points of Buddhist Teaching, using the approach of different Buddhist lineages and schools. The Buddha himself didn’t write anything. Now, Buddhist Scriptures (like the Bible) were written originally in Pali Language by the monks, following the Buddha’s passing. It is called “Tipitaka”, or “The Three Baskets” and are divided into three main books: The Discourses Basket (Suttanta Pitaka), it means, the discourses given by the Buddha; the Discipline Basket (Vinaya Pitaka), which the Monastic Codes for the monks and nouns; and the Trascendental Teachings Basket (Abhidhamma Pitaka), which is a compendium of the Buddha’s Teachings. The length of the Tipitaka is equivalent to 15 Bibles, and takes many years of study and guide. This Tipitaka belongs to the Theravada school. Mahayana school also has a Tipitaka, but was written in sanskrit and then translated to Chinese, Tibetan, Japanese, and other languages, and includes another Discourses given by the Buddha, not recognized by the Theravada Lineage. Apart from that scriptures, there are Commentaries, Treatises, etc, that makes Buddhism to have an enormous literary production. Due to this situation, I specially recommend the book written by Joseph Goldstein. in Amazon you can find it only for EUR 11,56. I want to say thank you for all your help. I have so many things to learn and obviously cannot ask you everything. It will take time. I was wodering one thing, if we start now in this life time to learn what we can to achieve enlightenment and we do very well or even better than we were living before, what happens when we start a new life in rebirth? do we have to start all over again to learn Buddhism and hoping that we become enlightened in the next life? in other workds will our subconscious be aware of our previous practice and move us in the right direction? cause it would seem an awful waste to work hard in this life and then to have to do it all over again from scratch?? Is this a stupid question.. I love this site and thank you so much for being here to help and guide every one.. With peace. Traditionally, it’s said that any “merit” (positive qualities) we’ve developed in this life will be carried into the next, but there’s no guarantee we’ll hold onto them. But if you have a kind of spiritual curiosity that leads you to reflection and meditation in this life that’s likely what will happen in the next. However, it’s only when we’ve attained the first level of enlightenment (Stream Entry) that we’re guaranteed not to slip back. That’s definitely doable in this lifetime. Lots of people get there, although it can take a couple of decades of practice. I have another post I’ve been working on as well. I must get back to that. But for now, in terms of practice, I’d suggest just working on mindfulness of breathing, lovingkindness practice, and being mindful and kind in daily life. All of this takes us in the direction of Stream Entry. Just wondering if we create our own problems with our mind and how we think, hoe does it work for animals.. do they creat their own suffering (cancers, depression?) as I am involved with animals I was curious to know if they are able to create with thought too. We certainly create some of our problems with our own minds, which is why one situation might be a pleasure for one person and yet intensely stressful for another. And to some extent that’s true for animals as well. You’ll know very well that different animals have their own personalities, and some are more fearful or confident than others. As far as I’m aware, though, animals don’t have much (or any) capacity for managing their emotions. You or I can experience fear and make a decision to overcome that fear, for example by reassuring ourselves. I’m not sure an animal can do that. Oh, the female Buddha will already have a name :) It may be Tara (a good Irish name for you!) or Prajnaparamita, or Guan Yin. If you can point me to a photo of her I can probably tell you who she is. Thanks again for your words. My statue is the Buddha of friendship. She is holding her hands in a prayer with a smile and it says this is called Namaste. It says the namastle Buddha symbolises warmth and goodwill to all you enter the home. A dot shows the third eye and the earlobes are elongated to symbolise the Buddha is all hearing to your needs. Do you know her? and a name I could put to her? I’d really have to see a picture to be able to say. I have been learning a lot about Buddhism since I last was in contact with you. Things have improved a bit since last time we connected. But my problem is how to stay calm and react when someone outs you down, taunts you, and I did get upset when I asked for 20 euro help for food as my first payday is next week and I was a little short. I helped this man before many many times, she I found out the money I gave him went to his ex wife. So when he didn’t help me with that 20 euro I found out he gave 100 to his ex wife for his kids. That does hurt, now I will struggle to eat next week trying to do my job and he is jobless and living n my house. He was my ex, and I can’t seem to get any peace, he interferes in everything. Please help me find a way NOT to react hen he puts me down etc. As you know my sister took her own life and this man has not given me the chance to grieve as I am dealing with him all the time. I want to be on my own. I want peace. I’m sorry to hear that you’ve been having a hard time. It’s not easy to comment on the kind of situation you describe, especially since I don’t quite understand the situation you describe. But in general I’d suggest that it’s best to accept that it’s painful to be in the situation where you expect help from someone but don’t get it. Let go of the story and just notice your pain — with mindfulness. Take an interest in the pain. Let go of any thinking that arises around it. Give the pain loving attention, like you would give loving attention to a child who was in pain. Responding this way can help you deal with what’s going on inside you. But then there’s how you deal with what’s going on outside you. There’s the issue of communicating how you feel. And then if you want to be on your own then that’s something you can follow through on, if that seems appropriate. But all of this is in the realms either of advice from friends or from a therapist, and so it’s not something I can provide. Dear Bodhipaksa, Thanks for your answer about the Heart Sutra Prajna-paramita mantra sometime ago. I’m still with that practice and can’t say enough (good!) about it… My question today is what are best possible name mantras for the Lotus Sutra in Sanskrit? I’ve run across these two: 1. Om Sadharma Pundarika Sutraya Namaha’ (14 syllables) and 2. Namas Sadharma Pundarika Sutra (11 syllables). Some who gave up another version of SDP may want to try this (& meditation etc)….I prefer #1. Is that OK? They’re “public domain” right, and the buddhas and bodhisattvas in the 10 directions will (if requested) empower without a guru right? Thank you for your response! peace. Those aren’t mantras I’ve come across, I’m afraid. I could dig around on Google, of course, but then you could do that yourself (and I’m sure you have!). The mantra of a sutra wouldn’t require any special “empowerment,” though. I just recently embrace and study Buddhism, and am starting to getting used to meditation. Is there any mantra while meditating? and is there any mantra to promote health, happiness and safety to our love one? I’m guessing you’d be interested in lovingkindness meditation, Eric. waw very interesting. So buddha of medecine for loosing all of a sudden energy in your back!I call it an empty feeling.Gone try! Or do you think another one! there are so many buddhist mantras, how do we know which ones we should stick to? I follow nichiren buddhism and i meditate to the white tara. any recommendations? Usually people will feel a resonance with a particular mantra, or more likely with the figure that the mantra represents, and so the choice isn’t something one consciously does, but that arises from within. thank you so much it was very helpful..
I’m very sorry to hear of your loss, Sapna, and of your depression. To convert to Buddhism I’d suggest finding a local Buddhist organization where you could officially take refuge in the Three Jewels. It would also make sense to start studying Buddhism, perhaps with an introductory book of some sort. Sorry to hear about your husband. I too had a tragedy when my only sister took her life. I found refuge and solace in the Buddhist religion and I even went to Nepal and India. I would however ask yourself what is the reason you wish to convert ti Buddhism and that you are doing it for the right reason. Grief takes many forms and twisted roads and what you feel now maybe not what you will feel later on. Thanks!! My husband taught me Buddhism . We use to pray together and often sing lotus sutra . He was a firm believer of after life . I want to convert coz we were planning to adopt Buddhism this year… I belong to Hindu family and finding very difficult to connect with Hindu gods.. I find peace by preaching Buddha.. although it’s very tough to meditate.. for me . In our locality there is one monastery but it is not good and recently something happened there.kindly suggest something to start as a learner at home. I’m sorry to hear that there are problems at your local monastery, but there’s a lot you can do on your own. First, I’d recommend that you learn to meditate. There’s a lot you can learn on this site (you can start here). Mindfulness of breathing and lovingkindness meditation is essential! As for studying Buddhist teachings, there’s a lot available online. The website Access to Insight contains a wide selection of original Buddhist scriptures in translation. There are lots of books available, and some of them are free. The first six on this page are all worth reading. Any mindful activity brings benefits, Clare. But one thing you can do is to hear a mantra in your head, rather than chant out loud. Doing this has many of the same benefits. I am in very painful situation. I have been in relation with my boyfriend some last 5 years. We were planning for marriage also but suddenly his mother against our marriage as his father died last year. No he completely avoiding me n not speaking with me the way he used to before. He is really very decent and good human being and I can’t leave without him. Please suggest me guide so that our relation will stay forever and we should get married. Please give me some mantra chanting which will turn to positive hopes and marriage. I used to chant Buddha vandana and panch shil. I don’t think mantra, or meditation generally, works that way. Perhaps what you need to think of doing is chanting a compassion mantra, such as Om Mani Padme Hum, to ask for comfort and reassurance in the face of your pain, and to help you let go of the past. If this man treated you this way he wasn’t right for you, and it’s better that the relationship is over. This is a good thing because it leaves you free to find someone you can have a better relationship with. Thank you for reply. I can’t live without him. He is best gift to me .. I m blessed to have him in my life. He care about me..He loves me more than anything. We were in 5 yrs of relation and had good understanding respect for each other but suddenly after his dad death everything has changed. He caught between his mother /family and me. Since beginning his parents were opposed to our marriage because of different religion. But still he always stood for me, now his father no more so he is depressed and emotionally attached to mother. His family not allowing him to continue relation with me and because of that he is avoiding me. I want him back in my life,I don’t want him to hurt his family sentiments. I can’t think about Any other person, he is like oxygen for me. Please suggest something any mantra chanting , daily fast.. I can do anything to get him back in my life..
You say you can’t live without him, Shital, but apparently you’re still alive. Does being without him make your heart stop beating or make your lungs stop breathing? No. You can live without him. You’re doing it right now. It’s just that at the moment it’s painful to experience his absence. We’ve all been through breakups. We’ve all felt that pain. The pain of your loss will pass as you learn to accept that the relationship is over. Cultivating compassion for yourself, or accepting the compassion of Avalokiteshvara or Tara, will help you to move on. You’ll find someone else in time. I am requesting you, please do not say negative about our relationship. It really hurt. I am very much hopeful , if something worst happened it’s my bad luck. But I will wait for him till end. He is really good human being, best son, best brother , best friend, best boyfriend . He is always ready to help people. I m not blindly in love with him. His nature is very caring and heart is pure. Now Situation is turned bad for us, it’s difficult for me and him to handle this situation. He can’t leave his family for me and I don’t want him to do this. Since this April everything changed. I m trying praying to change current situation ,phase and have happy life with him as it was before April 2016. I’d strongly suggest that you seek counseling, Shital, to help you deal with this situation. I am Buddhist and following Buddhism since childhood. I am hopeful and positive that Buddha will bring happiness in our relationship. I started chanting “Om Mani Padme Hum” this will definitely convert all negative thoughts, energy to positive. May chanting Om Mani Padme Hum bring you peace!